The internal combustion engine is an engine in which the burning of a fuel occurs in a confined space called a combustion chamber. This exothermic reaction of a fuel with an oxidizer creates gases of high temperature and pressure, which are permitted to expand. The defining feature of an internal combustion engine is that useful work is performed by the expanding hot gases acting directly to cause movement, for example by acting on pistons, rotors, or even by pressing on and moving the entire engine itself. This contrasts with external combustion engines, such as steam engines, which use the combustion process to heat a separate working fluid, typically water or steam, which then in turn does work, for example by pressing on a steam actuated piston. The term Internal Combustion Engine (ICE) is almost always used to refer specifically to reciprocating engines, Wankel engines and similar designs in which combustion is intermittent. However, continuous combustion engines, such as Jet engines, most rockets and many gas turbines are also internal combustion engines. Internal combustion engines are seen mostly in transportation. Several other uses are for any portable situation where you need an non-electric motor. The largest application in this situation would be an Internal combustion engine driving an electric generator. That way, you can use standard electric tools driven by an internal combustion engine. The advantages of these is the portability. It is more convenient using this type of engine in vehicles over electricity. Even in cases of hybrid vehicles, they still use an internal combustion engine to charge the battery. The disadvantage is the pollution that they put out. Not only the obvious, air pollution, but also pollution of broken or obsolete engines and waste parts, such as oil or rubber items that have to be discarded. Noise pollution is another factor, many internal combustion engines are very loud. Some are so loud, people need hearing protection to prevent damage their ears. Another disadvantage is size. It is very impractical to have small motors that can have any power. Electric motors are much more practical for this. That is why it is more likely to see an gas powered electric generator in an area that has no electricity to power smaller items. Demonstration of the internal combustion indirect or suction principle. This may not meet the definition of an engine, because the process does not repeat. 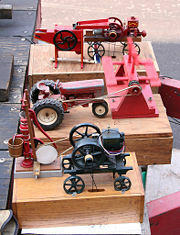 Early internal-combustion engines were used to power farm equipment similar to these models. The first internal combustion engines did not have compression, but ran on what air/fuel mixture could be sucked or blown in during the first part of the intake stroke. The most significant distinction between modern internal combustion engines and the early designs is the use of compression and in particular of in-cylinder compression. 1673: Christiaan Huygens described a compression-less engine. 1780's: Alessandro Volta built a toy electric pistol in which an electric spark exploded a mixture of air and hydrogen, firing a cork from the end of the gun. Seventeenth century: English inventor Sir Samuel Morland used gunpowder to drive water pumps. 1794: Robert Street built a compression-less engine whose principle of operation would dominate for nearly a century. 1806: Swiss engineer François Isaac de Rivaz built an internal combustion engine powered by a mixture of hydrogen and oxygen. 1823: Samuel Brown patented the first internal combustion engine to be applied industrially. It was compression-less and based on what Hardenberg calls the "Leonardo cycle," which, as this name implies, was already out of date at that time. Just as today, early major funding, in an area where standards had not yet been established, went to the best showmen sooner than to the best workers. 1824: French physicist Sadi Carnot established the thermodynamic theory of idealized heat engines. This scientifically established the need for compression to increase the difference between the upper and lower working temperatures, but it is not clear that engine designers were aware of this before compression was already commonly used. It may have misled designers who tried to emulate the Carnot cycle in ways that were not useful. 1826 April 1: The American Samuel Morey received a patent for a compression-less "Gas Or Vapor Engine." 1838: A patent was granted to William Barnet (English). This was the first recorded suggestion of in-cylinder compression. He apparently did not realize its advantages, but his cycle would have been a great advance if developed enough. 1854: The Italians Eugenio Barsanti and Felice Matteucci patented the first working efficient internal combustion engine in London (pt. Num. 1072) but did not get into production with it. It was similar in concept to the successful Otto Langen indirect engine, but not so well worked out in detail. 1860: Jean Joseph Etienne Lenoir (1822-1900) produced a gas-fired internal combustion engine closely similar in appearance to a horizontal double-acting steam beam engine, with cylinders, pistons, connecting rods, and flywheel in which the gas essentially took the place of the steam. This was the first internal combustion engine to be produced in numbers. His first engine with compression shocked itself apart. 1862: Nikolaus Otto designed an indirect-acting free-piston compression-less engine whose greater efficiency won the support of Langen and then most of the market, which at that time, was mostly for small stationary engines fueled by lighting gas. 1870: In Vienna, Siegfried Marcus, put the first mobile gasoline engine on a handcart. 1876: Nikolaus Otto working with Gottlieb Daimler and Wilhelm Maybach developed a practical four-stroke cycle (Otto cycle) engine. The German courts, however, did not hold his patent to cover all in-cylinder compression engines or even the four stroke cycle, and after this decision in-cylinder compression became universal. 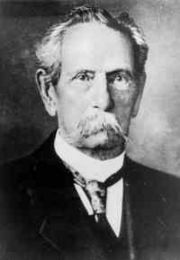 1879: Karl Benz, working independently, was granted a patent for his internal combustion engine, a reliable two-stroke gas engine, based on Nikolaus Otto's design of the four-stroke engine. Later Benz designed and built his own four-stroke engine that was used in his automobiles, which became the first automobiles in production. 1882: James Atkinson invented the Atkinson cycle engine. Atkinson’s engine had one power phase per revolution together with different intake and expansion volumes making it more efficient than the Otto cycle. 1891: Herbert Akroyd Stuart builds his oil engine leasing rights to Hornsby of England to build engines. They build the first cold start, compression ignition engines. In 1892, they install the first ones in a water pumping station. An experimental higher-pressure version produces self-sustaining ignition through compression alone in the same year. 1892: Rudolf Diesel develops his Carnot heat engine type motor burning powdered coal dust. 1893 February 23: Rudolf Diesel received a patent for the diesel engine. 1896: Karl Benz invented the boxer engine, also known as the horizontally opposed engine, in which the corresponding pistons reach top dead center at the same time, thus balancing each other in momentum. 1900: Rudolf Diesel demonstrated the diesel engine in the 1900 Exposition Universelle (World's Fair) using peanut oil (biodiesel). 1900: Wilhelm Maybach designed an engine built at Daimler Motoren Gesellschaft—following the specifications of Emil Jellinek—who required the engine to be named Daimler-Mercedes after his daughter. 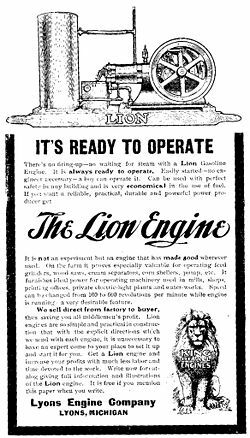 In 1902, automobiles with that engine were put into production by DMG. Internal combustion engines are most commonly used for mobile propulsion in automobiles, equipment, and other portable machinery. In mobile scenarios internal combustion is advantageous, since it can provide high power to weight ratios together with excellent fuel energy-density. These engines have appeared in almost all automobiles, motorcycles, boats, and in a wide variety of aircraft and locomotives. Where very high power is required, such as jet aircraft, helicopters, and large ships, they appear mostly in the form of turbines. They are also used for electric generators and by industry. All internal combustion engines depend on the exothermic chemical process of combustion: The reaction of a fuel, typically with air, although other oxidizers such as nitrous oxide may be employed. The most common fuel in use today are made up of hydrocarbons and are derived from mostly petroleum. These include the fuels known as diesel fuel, gasoline, and petroleum gas, and rare use of propane gas. Most internal combustion engines designed for gasoline can run on natural gas or liquified petroleum gases without major modifications except for the fuel delivery components. Liquid and gaseous biofuels, such as Ethanol and biodiesel, a form of diesel fuel that is produced from crops that yield triglycerides such as soy bean oil, can also be used. Some can also run on Hydrogen gas. All internal combustion engines must have a method for achieving ignition in their cylinders to create combustion. Engines use either a electrical method or a compression ignition system. Electrical/Gasoline-type ignition systems (that can also run on other fuels as previously mentioned) generally rely on a combination of a lead-acid battery and an induction coil to provide a high voltage electrical spark to ignite the air-fuel mix in the engine's cylinders. This battery can be recharged during operation using an electricity-generating device, such as an alternator or generator driven by the engine. Gasoline engines take in a mixture of air and gasoline and compress to less than 170 psi and use a spark plug to ignite the mixture when it is compressed by the piston head in each cylinder. Compression ignition systems, such as the diesel engine and HCCI (Homogeneous Charge Compression Ignition) engines, rely solely on heat and pressure created by the engine in its compression process for ignition. Compression that occurs is usually more than three times higher than a gasoline engine. Diesel engines will take in air only, and shortly before peak compression, a small quantity of diesel fuel is sprayed into the cylinder via a fuel injector that allows the fuel to instantly ignite. HCCI type engines will take in both air and fuel but will continue to rely on an unaided auto-combustion process due to higher pressures and heat. This is also why diesel and HCCI engines are also more susceptible to cold starting issues though they will run just as well in cold weather once started. Most diesels also have battery and charging systems however this system is secondary and is added by manufacturers as luxury for ease of starting, turning fuel on and off which can also be done via a switch or mechanical apparatus, and for running auxiliary electrical components and accessories. Most modern diesels, however, rely on electrical systems that also control the combustion process to increase efficiency and reduce emissions. 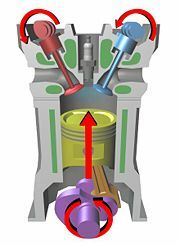 Once the available energy has been removed, the remaining hot gases are vented (often by opening a valve or exposing the exhaust outlet) and this allows the piston to return to its previous position (Top Dead Center—TDC). The piston can then proceed to the next phase of its cycle, which varies between engines. Any heat not translated into work is normally considered a waste product, and is removed from the engine either by an air or liquid cooling system. An illustration of several key components in a typical four-stroke engine. The parts of an engine vary depending on the engine's type. For a four-stroke engine, key parts of the engine include the crankshaft (purple), one or more camshafts (red and blue) and valves. For a two-stroke engine, there may simply be an exhaust outlet and fuel inlet instead of a valve system. In both types of engines, there are one or more cylinders (gray and green) and for each cylinder there is a spark plug (darker-gray), a piston (yellow) and a crank (purple). A single sweep of the cylinder by the piston in an upward or downward motion is known as a stroke and the downward stroke that occurs directly after the air-fuel mix in the cylinder is ignited is known as a power stroke. A Wankel engine has a triangular rotor that orbits in an epitrochoidal (figure 8 shape) chamber around an eccentric shaft. The four phases of operation (intake, compression, power, exhaust) take place in separate locations, instead of one single location as in a reciprocating engine. With that said, one must understand that common usage does often dictate definitions. Many individuals consider engines as those things which generate their power from within, and motors as requiring an outside source of energy to perform their work. Evidently, the roots of the words seem to actually indicate a real difference. Further, as in many definitions, the root word only explains the beginnings of the word, rather than the current usage. It can certainly be argued that such is the case with the words motor and engine. Engines based on the two-stroke cycle use two strokes (one up, one down) for every power stroke. Since there are no dedicated intake or exhaust strokes, alternative methods must be used to scavenge the cylinders. The most common method in spark-ignition two-strokes is to use the downward motion of the piston to pressurize fresh charge in the crankcase, which is then blown through the cylinder through ports in the cylinder walls. Spark-ignition two-strokes are small and light (for their power output), and mechanically very simple. Common applications include snowmobiles, lawnmowers, weed-whackers, chain saws, jet skis, mopeds, outboard motors, and some motorcycles. Unfortunately, they are also generally louder, less efficient, and far more polluting than their four-stroke counterparts, and they do not scale well to larger sizes. Interestingly, the largest compression-ignition engines are two-strokes, and are used in some locomotives and large ships. These engines use forced induction to scavenge the cylinders. two stroke engines are less fuel efficient than other types of engines because unspent fuel being sprayed into the combustion chamber can some times escape out of the exhaust duct with the previously spent fuel. Without special exhaust processing, this will also produce very high pollution levels, requiring many small engine applications such as lawnmowers to employ four stroke engines, and smaller two-strokes to be outfitted with catalytic converters in some jurisdictions. Engines based on the four-stroke cycle or Otto cycle have one power stroke for every four strokes (up-down-up-down) and are used in cars, larger boats and many light aircraft. They are generally quieter, more efficient and larger than their two-stroke counterparts. There are a number of variations of these cycles, most notably the Atkinson and Miller cycles. Most truck and automotive Diesel engines use a four-stroke cycle, but with a compression heating ignition system. This variation is called the diesel cycle. Engines based on the five-stroke cycle are a variant of the four stroke cycle. Normally the four cycles are intake, compression, combustion and exhaust. The fifth cycle added by Delautour is refrigeration. Engines running on a five-stroke cycle are up to 30 percent more efficient than an equivalent four stroke engine. In this engine, two diametrically opposed cylinders are linked to the crank by the crank pin that goes through the common scottish yoke. The cylinders and pistons are so constructed that there are, as in the usual two stroke cycle, two power strokes per revolution. However, unlike the common two stroke engine, the burnt gases and the incoming fresh air do not mix in the cylinders, contributing to a cleaner, more efficient operation. The scotch yoke mechanism also has low side thrust and thus greatly reduces friction between pistons and cylinder walls. The Bourke engine's combustion phase more closely approximates constant volume combustion than either four stroke or two stroke cycles do. It also uses less moving parts, hence needs to overcome less friction than the other two reciprocating types have to. In addition, its greater expansion ratio also means more of the heat from its combustion phase is utilized than is used by either four stroke or two stroke cycles. These are also cylinder based engines may be either single or two stroke but use, instead of a crankshaft and piston rods, two gear connected, counter rotating concentric cams to convert reciprocating motion into rotary movement. These cams practically cancel out sideward forces that would otherwise be exerted on the cylinders by the pistons, greatly improving mechanical efficiency. The profiles of the cam lobes(which are always odd and at least three in number) determine the piston travel versus the torque delivered. In this engine, there are two cylinders that are 180 degrees apart for each pair of counter rotating cams. For single stroke versions, there are the same number of cycles per cylinder pair as there are lobes on each cam, twice as much for two stroke units. The Wankel engine operates with the same separation of phases as the four-stroke engine (but with no piston strokes, would more properly be called a four-phase engine), since the phases occur in separate locations in the engine. This engine provides three power "strokes" per revolution per rotor, giving it a greater power-to-weight ratio, on average, than piston engines. This type of engine is used in the Mazda current RX8 and earlier RX7 as well as other models. With gas turbine cycles (notably Jet engines), rather than use the same piston to compress and then expand the gases, instead separate compressors and gas turbines are employed; giving continuous power. Essentially, the intake gas (air normally) is compressed, and then combusted with a fuel, which greatly raises the temperature and volume. The larger volume of hot gas from the combustion chamber is then fed through the gas turbine which is then easily able to power the compressor. In some old non-compressing internal combustion engines: In the first part of the piston downstroke a fuel/air mixture was sucked or blown in. In the rest of the piston downstroke the inlet valve closed and the fuel/air mixture fired. In the piston upstroke the exhaust valve was open. This was an attempt at imitating the way a piston steam engine works. Fuels used include petroleum spirit (North American term: Gasoline, British term: Petrol), autogas (liquified petroleum gas), compressed natural gas, hydrogen, diesel fuel, jet fuel, landfill gas, biodiesel, biobutanol, peanut oil and other vegoils, bioethanol, biomethanol (methyl or wood alcohol), and other biofuels. Even fluidized metal powders and explosives have seen some use. Engines that use gases for fuel are called gas engines and those that use liquid hydrocarbons are called oil engines. However, gasoline engines are unfortunately also often colloquially referred to as "gas engines." The oxidizer is typically air, and has the advantage of not being stored within the vehicle, increasing the power-to-weight ratio. Air can, however, be compressed and carried aboard a vehicle. Some submarines are designed to carry pure oxygen or hydrogen peroxide to make them air-independent. Some race cars carry nitrous oxide as oxidizer. Other chemicals, such as chlorine or fluorine, have seen experimental use; but most are impractical. Diesel engines are generally heavier, noisier, and more powerful at lower speeds than gasoline engines. They are also more fuel-efficient in most circumstances and are used in heavy road vehicles, some automobiles (increasingly more so for their increased fuel efficiency over gasoline engines), ships, railway locomotives, and light aircraft. Gasoline engines are used in most other road vehicles including most cars, motorcycles, and mopeds. Note that in Europe, sophisticated diesel-engined cars have become quite prevalent since the 1990s, representing around 40 percent of the market. Both gasoline and diesel engines produce significant emissions. There are also engines that run on hydrogen, methanol, ethanol, liquefied petroleum gas (LPG), and biodiesel. Paraffin and tractor vaporising oil (TVO) engines are no longer seen. Some have theorized that in the future hydrogen might replace such fuels. Furthermore, with the introduction of hydrogen fuel cell technology, the use of internal combustion engines may be phased out. The advantage of hydrogen is that its combustion produces only water. This is unlike the combustion of fossil fuels, which produce carbon dioxide, a principle cause of global warming, carbon monoxide resulting from incomplete combustion, and other local and atmospheric pollutants such as sulfur dioxide and nitrogen oxides that lead to urban respiratory problems, acid rain, and ozone gas problems. However, free hydrogen for fuel does not occur naturally, burning it liberates less energy than it takes to produce hydrogen in the first place by the simplest and most widespread method, electrolysis. Although there are multiple ways of producing free hydrogen, those require converting currently combustible molecules into hydrogen, so hydrogen does not solve any energy crisis, moreover, it only addresses the issue of portability and some pollution issues. The big disadvantage of hydrogen in many situations is its storage. Liquid hydrogen has extremely low density- 14 times lower than water and requires extensive insulation, whilst gaseous hydrogen requires very heavy tankage. Although hydrogen has a higher specific energy, the volumetric energetic storage is still roughly five times lower than petrol, even when liquified. (The "Hydrogen on Demand" process, designed by Steven Amendola, creates hydrogen as it is needed, but this has other issues, such as the raw materials being relatively expensive.) Other fuels that are kinder on the environment include biofuels. These can give no net carbon dioxide gains. One-cylinder gasoline engine (c. 1910). Internal combustion engines can contain any number of cylinders with numbers between one and twelve being common, though as many as 36 (Lycoming R-7755) have been used. Having more cylinders in an engine yields two potential benefits: First, the engine can have a larger displacement with smaller individual reciprocating masses (that is, the mass of each piston can be less) thus making a smoother running engine (since the engine tends to vibrate as a result of the pistons moving up and down). Second, with a greater displacement and more pistons, more fuel can be combusted and there can be more combustion events (that is, more power strokes) in a given period of time, meaning that such an engine can generate more torque than a similar engine with fewer cylinders. The down side to having more pistons is that, over all, the engine will tend to weigh more and tend to generate more internal friction as the greater number of pistons rub against the inside of their cylinders. This tends to decrease fuel efficiency and rob the engine of some of its power. For high performance gasoline engines using current materials and technology (such as the engines found in modern automobiles), there seems to be a break point around 10 or 12 cylinders, after which addition of cylinders becomes an overall detriment to performance and efficiency, although exceptions such as the W16 engine from Volkswagen exist. Most car engines have four to eight cylinders, with some high performance cars having ten, twelve, or even sixteen, and some very small cars and trucks having two or three. In previous years, some quite large cars, such as the DKW and Saab 92, had two cylinder, two stroke engines. Radial aircraft engines, now obsolete, had from three to 28 cylinders, such as the Pratt & Whitney R-4360. A row contains an odd number of cylinders, so an even number indicates a two or four-row engine. The largest of these was the Lycoming R-7755 with 36 cylinders (four rows of nine cylinders) but never entered production. Motorcycles commonly have from one to four cylinders, with a few high performance models having six (though some "novelties" exist with 8, 10, and 12). Internal combustion engines can be classified by their ignition system. The point in the cycle at which the fuel/oxidizer mixture are ignited has a direct effect on the efficiency and output of the ICE. For a typical 4 stroke automobile engine, the burning mixture has to reach its maximum pressure when the crankshaft is 90 degrees after TDC (Top dead centre). The speed of the flame front is directly affected by compression ratio, fuel mixture temperature and octane or cetane rating of the fuel. Modern ignition systems are designed to ignite the mixture at the right time to ensure the flame front doesn't contact the descending piston crown. If the flame front contacts the piston, pinking or knocking results. Leaner mixtures and lower mixture pressures burn more slowly requiring more advanced ignition timing. Today most engines use an electrical or compression heating system for ignition. However outside flame and hot-tube systems have been used historically. Nikola Tesla gained one of the first patents on the mechanical ignition system with U.S. Patent 609250 (PDF), "Electrical Igniter for Gas Engines," on August 16, 1898. Fuels burn faster, and more completely when they have lots of surface area in contact with oxygen. In order for an engine to work efficiently the fuel must be vaporized into the incoming air in what is commonly referred to as a fuel air mixture. There are two commonly used methods of vaporizing fuel into the air, one is the carburetor and the other is fuel injection. Often for simpler, reciprocating engines a carburetor is used to supply fuel into the cylinder. However, exact control of the correct amount of fuel supplied to the engine is impossible. Carburetors are the current most widespread fuel mixing device used in lawnmowers and other small engine applications. Prior to the mid-1980s, carburetors were also common in automobiles. Larger gasoline engines such as those used in automobiles have mostly moved to fuel injection systems. Diesel engines always use fuel injection. Autogas (LPG) engines use either fuel injection systems or open or closed loop carburetors. Other internal combustion engines like jet engines use burners, and rocket engines use various different ideas including impinging jets, gas/liquid shear, preburners, and many other ideas. Internal combustion engines can be classified by their configuration which affects their physical size and smoothness (with smoother engines producing less vibration). Common configurations include the straight or inline configuration, the more compact V configuration and the wider but smoother flat or boxer configuration. Aircraft engines can also adopt a radial configuration which allows more effective cooling. More unusual configurations, such as "H," "U," "X," or "W" have also been used. An engine's capacity is the displacement or swept volume by the pistons of the engine. It is generally measured in liters (L) or cubic inches (c.i. or in³) for larger engines and cubic centimeters (abbreviated to cc) for smaller engines. Engines with greater capacities are usually more powerful and provide greater torque at lower rpm but also consume more fuel. An engine's quoted capacity can be more a matter of marketing than of engineering. The Morris Minor 1000, the Morris 1100, and the Austin-Healey Sprite Mark II were all fitted with a BMC A-Series engine of the same stroke and bore according to their specifications, and were from the same maker. However the engine capacities were quoted as 1000cc, 1100cc, and 1098cc respectively in the sales literature and on the vehicle badges. There are several different types of lubrication systems used. Simple two-stroke engines are lubricated by oil mixed into the fuel or injected into the induction stream as a spray. 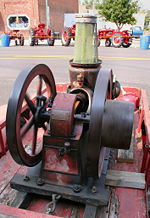 Early slow speed stationary and marine engines were lubricated by gravity from small chambers, similar to those used on steam engines at the time, with an engine tender refilling these as needed. As engines were adapted for automotive and aircraft use, the need for a high power to weight ratio lead to increased speeds, higher temperatures, and greater pressure on bearings, which, in turn, required pressure lubrication for crank bearing and connecting rod journals, provided either by a direct lubrication from a pump, or indirectly by a jet of oil directed at pickup cups on the connecting rod ends, which had the advantage of providing higher pressures as engine speed increased. Generally internal combustion engines, particularly reciprocating internal combustion engines, produce moderately high pollution levels, due to incomplete combustion of carbonaceous fuel, leading to carbon monoxide and some soot along with oxides of nitrogen and sulfur and some unburnt hydrocarbons depending on the operating conditions and the fuel/air ratio. The primary causes of this are the need to operate near the stoichiometric ratio for petrol engines in order to achieve combustion (the fuel would burn more completely in excess air) and the "quench" of the flame by the relatively cool cylinder walls. Diesel engines produce a wide range of pollutants including aerosols of many small particles (PM10) that are believed to penetrate deeply into human lungs. Engines running on liquefied petroleum gas (LPG) are very low in emissions as LPG burns very clean and does not contain sulphur or lead. The efficiency of various types of internal combustion engines vary. It is generally accepted that most gasoline fueled internal combustion engines, even when aided with turbochargers and stock efficiency aids, have a mechanical efficiency of about 20 percent. Most internal combustion engines waste about 36 percent of the energy in gasoline as heat lost to the cooling system and another 38 percent through the exhaust. The rest, about six percent, is lost to friction. Most engineers have not been able to successfully harness wasted energy for any meaningful purpose, although there are various add on devices and systems that can greatly improve combustion efficiency. Hydrogen Fuel Injection, or HFI, is an engine add on system that is known to improve fuel economy of internal combustion engines by injecting hydrogen as a combustion enhancement into the intake manifold. Fuel economy gains of 15 percent to 50 percent can be seen. A small amount of hydrogen added to the intake air-fuel charge increases the octane rating of the combined fuel charge and enhances the flame velocity, thus permitting the engine to operate with more advanced ignition timing, a higher compression ratio, and a leaner air-to-fuel mixture than otherwise possible. The result is lower pollution with more power and increased efficiency. Some HFI systems use an on board electrolyzer to generate the hydrogen used. A small tank of pressurized hydrogen can also be used, but this method necessitates refilling. There has also been discussion of new types of internal combustion engines, such as the Scuderi Split Cycle Engine, that utilize high compression pressures in excess of 2000 psi and combust after top-dead-center (the highest & most compressed point in a internal combustion piston stroke). Such engines are expected to achieve efficiency as high as 50-55%. ↑ Thinkquest, http://library.thinkquest.org/C006011/english/sites/huygens.php3?v=2 Huygens.] Retrieved July 16, 2008. ↑ Tony Williams, 101 Ingenious Kiwis (Reed Publishing NZ Ltd, 2006), p. 83. Hardenberg, Horst O. 1999. The Middle Ages of the Internal Combustion Engine. Warrendale, PA: SAE International Publishing. ISBN 0768003911. Heywood, John. 1988. Internal Combustion Engine Fundamentals. New York: McGraw-Hill Science/Engineering/Math. ISBN 007028637X. Stone, Richard. 1999. Introduction to Internal Combustion Engines. Warrendale, PA: SAE International Publishing. ISBN 0768004950. Taylor, Charles Fayette. 1985. The Internal Combustion Engine in Theory and Practice. Cambridge, MA: The MIT Press. ISBN 0262700263. History of "Internal combustion engine"
This page was last modified on 4 March 2018, at 17:04.